"Such a great change of pace from other more typical fruit pies." Preheat oven to 400 degrees F (200 degrees C). 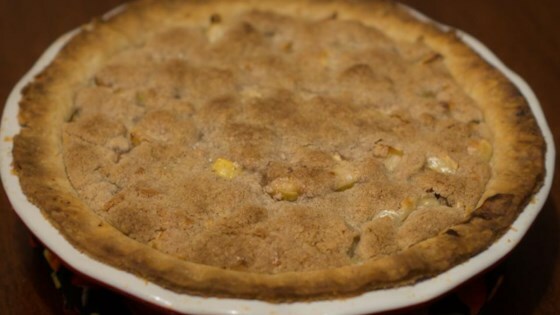 Press pie crust into a 9-inch pie dish. Arrange pear slices in the pie crust. Stir sour cream, 1/2 cup sugar, 2 tablespoons flour, egg, vanilla extract, and salt together in a bowl; pour over pears. Mix 1/2 cup flour, butter, 1/4 cup sugar, and cinnamon together in a bowl until topping resembles coarse crumbs. Bake pie in the preheated oven for 35 minutes. Sprinkle topping onto pie and continue baking until topping is golden brown, about 10 more minutes. This was beyond delicious!! We had two pieces for dessert and already my husband is saying "You can make this again!". Thank you for this recipe. Made it and it was devoured. Great pie. Fruity and not overly sweet. Everyone ravers about it. This pie is amazingly good. Sounded like it would be weird. I made it for Thanksgiving and everyone who tried it loved it! Very good pie! My husband is a big pie fan and I got two thumbs up!! I made this because I had a spare pie crust and pears are in season. I used light sour cream instead of regular but made no other changes. It is fantastic, everyone loved it!